My most popular model to date. This 00 model, 14 frets to the body is an incredibly powerful "finger-style" guitar. It feels like a small body guitar, but it's volume and voice turns heads! 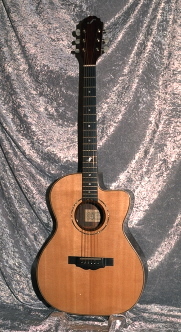 Several different versions of this guitar have been spun from it's original design including the experimental Lee Valley guitar. The first L-49 I built is owned by my daughter Lindsay. Optional cutaway version available.